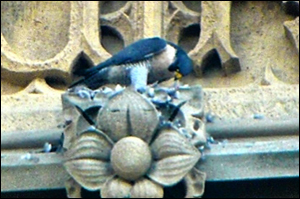 One of the falcons spotted at Britain's Houses of Parliament. Will Londoners fall in love with the pair of peregrine falcons nesting in the House of Commons building to the extent that Brisbane's citizens adore Frodo and Frieda? A team led by London wildlife volunteer David Morrison spotted the parliamentary pair and reported them to the London Wildlife Trust, which promptly issued a news release. Peregrine falcons are raptors (birds of prey), and can reach a speed of 322 km/h (200 mph), making them the planet's fastest animal. London bird lovers may not share Morrison's delight about the newly found pair, if the birds swoop on Trafalgar Square's famous pigeons for a tasty breakfast. (Falcons have been seen on other London landmarks including Tate Modern, Battersea Power Station and the Millennium Dome). In Brisbane, Australia's third largest city, thousands of Web viewers have eagerly watched Frodo and Frieda building nests and raising chicks every year since 2003. Ever since 1999, the birds have lived on a ledge on the 27th floor of the Admiralty Towers building in the city's central business district. In 2003 the daily newspaper The Courier-Mail set up a camera Web site to keep track of their fascinating domestic life. Right now, Frodo and Frieda seem to be looking around for a new home on a nearby tall building. Perhaps they're seeking privacy, away from the world's gaze. London and Brisbane are by no means the only cities with peregrine falcon Webcams. The raptors are found worldwide, and bird lovers flock to watch them on local Webcams. In 1998 a trio of enterprising Kodak employees -- Kenn Martinez, Brad Carney and Matt Bernius -- placed a video camera on the steeple of the tower, aimed it at the nest box, and connected it to the Internet. The stars of their new Web site- the Kodak Birdcam - were a pair of Peregrine falcons, the fastest animals on the planet. To honor their legacy as masters of the air, the falcons were given wind-themed names by the Kodak Birdcam team. Mariah, for the female, after Kodak founder George Eastman's mother and the 1951 Lerner and Lowe song "They Call the Wind Mariah." Cabot-Sirocco, the male, was hatched in Toronto and named Cabot by the folks at the Canadian Peregrine Foundation (in honor of the French explorer of the same name). Kodak named him Sirocco (a dry desert wind), and his US and Canadian names were combined as "Cabot-Sirocco." In 2002 a new male joined Mariah when Cabot-Sirocco failed to return that spring. A high resolution digital camera, installed only weeks before, revealed that this new tiercel, or male falcon, wore no identification bands on his legs, unlike Cabot-Sirocco. The new arrival was named Kaver, after a gentle breeze that blows in the Hebrides islands near Scotland. Elsewhere in the US, peregrine falcons' nests have been found on skyscrapers in New York City, Columbus Ohio, Harrisburg Pennsylvania, and Atlanta Georgia, to name just a few. In many cities, webcams attract vast numbers of viewers. In downtown San Francisco, California, in 2005, a camera was set up to spy on a peregrine falcon nest on the northwest corner of the Pacific Gas & Electric Company headquarters building. A pair of peregrines, dubbed George and Gracie, built a nest on the 33rd floor ledge of the building, and reared three chicks. Then they moved across the street to 201 Mission St. and so did the Webcam. In 2007, George and Gracie built a nest on the Bay Bridge, off camera. Fearful biologists removed the eggs from that perilous site and took them to a Santa Cruz facility to hatch in greater safety. In fact, people are still grieving over George and Gracie's disappearance, after the falcons were driven away by another pair. "People actually saw the battle taking place in the air between the falcons," wildlife biologist Glenn Stewart said, "but I guarantee no one would ever have noticed if we hadn't let them get involved through the Webcams." Also in California, a pair of falcons named Carlos and Clara are raising three healthy chicks in a nest box at San Jose City Hall. A Webcam has averaged 18,000 visits daily. San Jose Mayor Chuck Reed and his office have been enthusiastic participants in this online reality show, issuing regular press releases with updates on the City Hall falcon family. For weeks the mayor's web site promoted a "Name That Falcon" contest for San Jose kids to name the three chicks. The City of San Jose also provides funding ($45,000 this year) to support SCPBRG [Santa Cruz Predatory Bird Research Group] 's work with the falcons and its outreach programs in local schools. While the chicks are certainly cute, viewers aren't spared the grisly sight of hungry falcons feasting on their favorite prey: smaller birds. "They've even seen a parent return with prey that was still alive and twitching," said Jaime Jansen, one of Stewart's interns and a junior majoring in anthropology at UCSC [University of California at Santa Cruz]. "But that's real life. People need to expect that not everything is going to be pretty."